Norton and T’akaya, playing rough outside when the weather was nice. Fine. If that didn’t work, then it would be time to use our tried and true method of toddler discipline. I sent Norton to his room. You’d think that this would be perfect. Everything would be just fine. The dog would have time to calm down and get over Norton aggravating her. Norton would have time to calm down and be the relaxed little boy that he can be. Norton was okay in his room for a while. The problem was the dog. Almost immediately, T’akaya was pacing outside Norton’s room, sniffing and scratching at the door. Color me not impressed. I separated the two of them for T’akaya’s safety. (And Norton’s, of course. A time might come when T’akaya will be so sick and tired of Norton yanking on her tail that she decides to defend herself. I’d rather that time not come at all.) She was over being annoyed and needed to not be harassed. And there she was, just begging for me to let her tormenter out. It’s crazy and stupid, of course, but at the end of the day, it seems that T’akaya really does adore Norton and hates to have him gone. Even if he does aggravate the stuffing out of her. It’s nuts, but there you go. 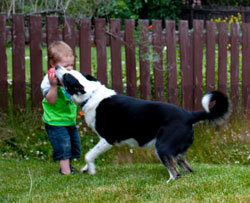 Have you observed any confusing stuff in your toddler/doggy relationship? How did you cope? Disclosure: This post contains affiliate links. I receive a small commission from purchases made from those links, which is used to support Motherhood Looms. My cat and daughter are the same way. The cat sits down next to my daughter. My daughter yanks on the cat or lays on her. The cat meows and moves a foot away. Then my daughter crawls over to her and the whole thing starts again. If the cat wanted to get away, she totally could. Animals and babies are funny.